Welcome to Von Neuburg Standard Schnauzers, we are located in Canada in Newmarket Ontario and breed for both tempermant and style. This Canadian Standard Schnauzer page, since 1997, the first Canadian Standard Schanuzer site on the net has been visited times. * PUPPY ALERT * Bindi had a beautiful litter of 9 puppies (5M 4F) on the first day of spring March 20, 2012 and not to worry these little ones with have lots of little girls to play with and be socialized to the max. my girls (with 2 legs) love puppies!. is owned by Sheila & Ralph Neumann. Member of the Schnauzer World Web Ring! This Show Dog site is owned by Sheila & Ralph Neumann. 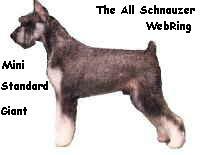 This All Schnauzer site is owned by Sheila & Ralph Neumann.